After four successful instructional DVDs called “Jointer and Planer Secrets”, “Revelations on Table Saw Set-up & Safety”, “Working with Plywood” and “Wood Science & Design”, Hendrik decided to turn his attention to the world of hand staining and finishing techniques. It starts with this 5-DVD set called “Surface Preparation and Staining” and then moves on to a companion 5-DVD set named “Hand Finishing and Rubbing Out”. The first DVD set takes you through everything you need to know to successfully prepare the wood surface for staining and finishing, followed by the hand staining techniques themselves, all spread over 9 hours of footage on 5 discs. As is Hendrik’s usual style, this DVD set is a detailed step-by-step course – not the “usual” DVD fare that may have disappointed you in the past. The DVD starts with a review of hand finishing techniques, using a simple wooden sanding block and progressing to contoured sanding grips for routed details and soft foam pads for mouldings. The discussion and demonstration then moves to machine sanding, covering belt sanding, palm sanding and random orbit sanding. Hendrik goes as far as outlining his personal sanding routine from the progression of sanding grits, approximate number of strokes and even sanding patterns that help keep the workpiece as flat as possible. From there, the discussion moves to glue squeeze-out and how to test for it and remove it. Hendrik covers the removal of dents and other compressed fibres using water and steam. He then moves on to pre-raising the grain when using water based products. He also covers the how and why of wood bleaching. Of special note, Hendrik demonstrates his secrets for preventing end grain from getting stained darker than long grain, a common problem when staining items like solid wood table tops. He also covers the reason why plywood veneers often stain to a completely different colour than solid wood of the same species, showing you numerous examples of this phenomenon and how to get around it. One of the areas most woodworkers need to learn about is the problem of stain blotching, which occurs on most softwoods and many hardwoods like cherry and birch. Hendrik reviews the reasons for blotching and explains how he deals with the problem without using any pre-stain conditioners at all. He shows you numerous examples of just how bad the blotching problem can be, as well as how well blotchy species can be stained with the right products. He also explains the flip-side of blotching where you want to highlight striking grain patterns such as “curly” maple – a grain structure Hendrik refers to as “organized blotching”. From there, Hendrik goes into a vast array of stain products from liquid pigment stain/dye combinations to asphaltum, aniline dye and gel stains. He thoroughly reviews the characteristics of each type of stain product and outlines the advantages and disadvantages of each. He demonstrates the proper hand application techniques for each stain product, showing it not just on one species of wood, but on knotty pine, maple, oak and other species. You won’t want to miss Chapter 12, where Hendrik reviews his favourite stain type for each of the more common species. Hendrik really stresses the fact that one type of stain can be perfect on a certain species, but the worst possible choice on another. The characteristics of the wood, from grain structure to special figure and uneven density, determine the correct type of stain product for each application. Hendrik even devotes a special section to staining inside corners, in case you are fed up with videos that only cover the staining and finishing of flat panels. The final chapter of this DVD series, in Hendrik’s well known “bonus footage” section, he offers the most thorough review of card scrapers and scraping planes ever filmed. This chapter offers almost 2 ½ hours of footage on these important woodworking hand tools, from initial tune-up of a new scraper to jointing, using a burnishing rod and using the tool. He covers the most common reasons that amateur woodworkers have failed to master these simple woodworking tools, showing you not only how to burnish a scraper but how to restore a dull scraper back to pristine condition before putting on a new burr. His techniques are specific, extremely detailed and focused so that you can achieve the same results in your own workshop. As always, Hendrik’s DVD courses are not like the usual 45 to 60 minute production you may have found disappointing in the past. Hendrik takes you through every procedure in real time so that you fully understand how the techniques work. Most woodworking videos and television shows just show you the “gist” of each technique, editing away the finer details and problems that might come up. The details are everything if you really want to advance and excel in this craft. Hendrik covers all of the high-level details that he can normally convey only in person. This is truly personal coaching conveyed in a DVD format. As a 5-DVD boxed set running at 9 full hours, “Surface Preparation and Staining” is sure to become the leading instructional woodworking DVD in this area. 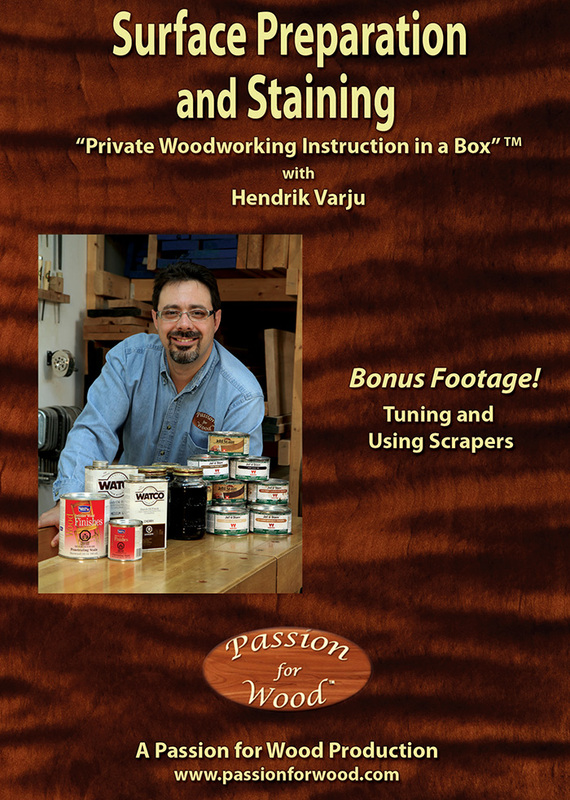 As the trademarked name says, this is “Private Woodworking Instruction in a Box” and nothing short of Hendrik’s in-shop seminars and courses even comes close.